Sometimes I like to take a quick break from my longer term projects and just put together something simple. On New Years Day '07, we were without family plans for the day, so I decided to pull out this Revell kit and see if I could get it together in one day. It seemed like a simple enough plan. I was starting with the pre-painted die-cast version of this kit so I thought I could get it all toghter in a few hours if I worked fast. Of course I can't ever seem to leave well enough alone so right away I started seeing ways I could improve upon what was in the box. Out of the box, this kit is intended to be a low rider. Low riders aren't really my thing so much, but I thought the kit might make a neat looking contemporary custom. The first change I made was to the side moldings. The wide inserts in the chrome were painted hot pink. I wanted something a little more subtle looking. The trim comes already assembled to the body. I carefully removed everything and re-sprayed it silver to better match a factory look. While the trim was all off, I also ground down the back side with a Dremel for a much tighter and more realistic fit to the body. 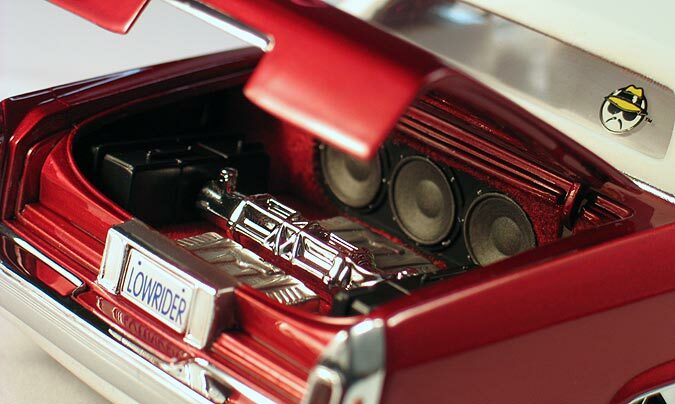 One of the neat features of this kit is it's opening trunk which shows off a stereo system and hydraulic pumps. I painted the carpeting in the trunk and interior dark red and added flocking material for a more realistic look. I also added a pair of my own resin cast amplifiers to complete the stereo. The kit comes with a set of 14" gold wire wheels. After digging through a bunch of kits trying to find something I liked better I stumbled across an optional set of wheels from a die-cast Fast and Furious Mazda RX-7. Kind of an unlikely source, but I thought the wheels actually looked pretty good so I went with them. I then modified the suspension so the car would sit with the right "down in the weeds" stance. I then foiled all the trim, threw some black wash on the front grill and called it a day. Well, I my "quick" project turned out to be three evening project, but I guess that's still pretty quick for me.